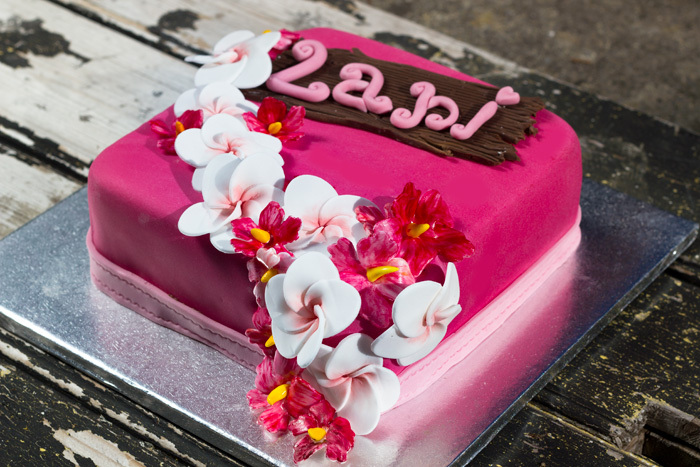 Hawaiian themed cake with Hibiscus and Frangipani flowers. Pineapple coconut and banana or chocolate cake. A while ago I was asked to make my first 1st Birthday cake…exciting! 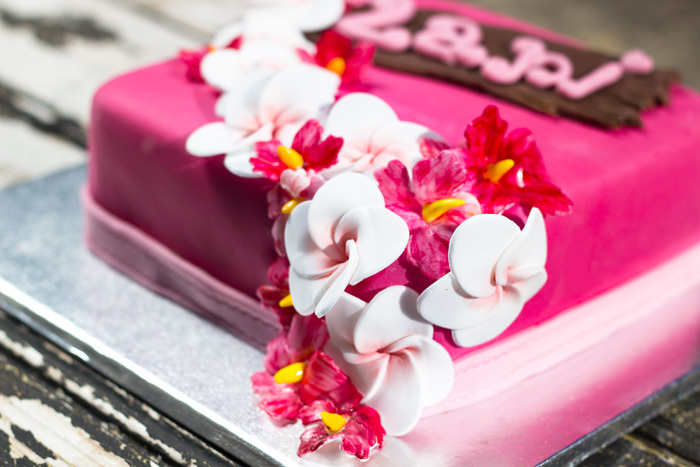 When I asked what type of cake they wanted the response was instant – A Hawaiian cake! The cake is for Lani which means Heavenly in Hawaiian. 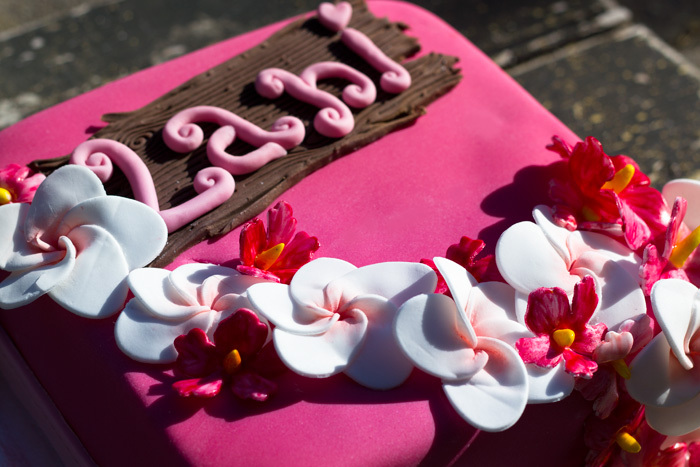 Lani’s mum had a look around and drew me an image of what she would like – a chocolate cake with Frangipani’s, Hawaiian Hibiscus’ and driftwood with her name on it. I am not going to lie – this was all pretty daunting. I have never tried to make sugarpaste flowers before. I ordered a Hibiscus flower cutter but when it arrived the instructions said you needed loads of other things so I panicked – how am I going to do this?! Luckily my husband calmed me down (and then left me to it while he went and got beer…I think he thought he was in for a long night with tears and tantrums!! ), I had a go and slowly they started working. Woop….now I can enjoy making this (no tears and tantrums this time!)! A drying rack – can be anything! Pick them up and roll them up in your hands. Squeeze the bottom together and secure the petals with a bit of water. Hold them for a few seconds while they set. To make the driftwood, I used a wood embossing mat and then roughed it up a bit along the edges with a sharp knife. 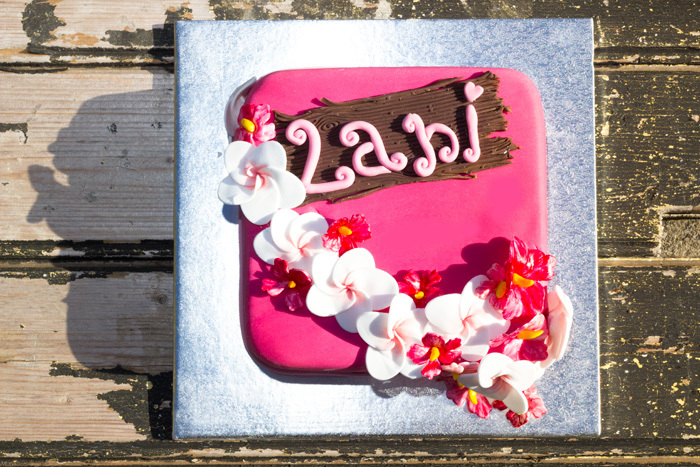 And Lani’s name is just made using pink sugarpaste. Ice the cake with buttercream – don’t worry about how messy it looks – you are going to cover it all! Roll out the sugarpaste to your desired thickness and then lay it on the cake. Remember to smooth the icing in an upwards motion on the sides to prevent it from dragging down and breaking. Trim around the bottom. Carefully lie the driftwood on the cake. Secure with water or edible glue if you feel it needs extra support. Then place the name on top of this. If your icing is a little rough around the edges the best way to cover this is with ribbon secured with a pin. 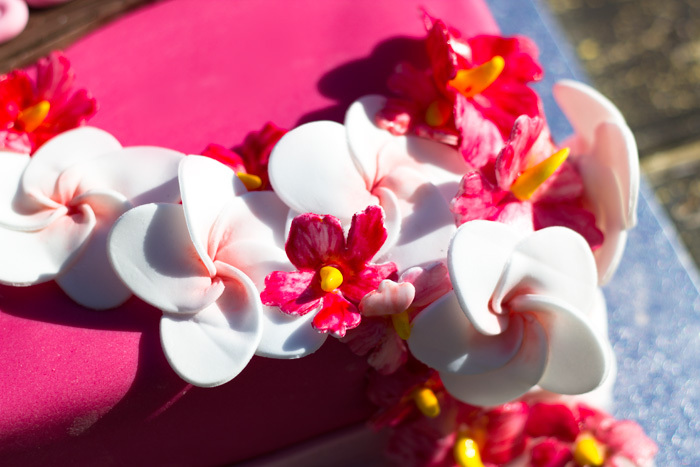 I made a ribon band using sugarpaste and covered the joins with Frangipani’s! Then place your flowers wherever you want them. I used edible glue to secure them and pressed them into the icing. Preheat oven to 180C, with rack in the center. Butter two 9-by-2-inch round cake pans. Line the bottoms of the pans with parchment paper. Butter paper, and dust the pans with flour, tapping out any excess. Set aside. In a medium bowl, sift together flour, baking soda, cinnamon, and salt; set aside. In the bowl of an electric mixer, beat oil, vanilla, and sugar until combined, about 2 minutes. Add eggs one at a time, incorporating each before adding the next. Beat at medium speed until mixture is pale yellow and fluffy, about 3 minutes. In a medium bowl, mix together banana, pineapple, walnuts, and coconut. Add to egg mixture; stir until well combined. Add flour mixture; blend well. Divide batter between pans. Bake, rotating pans halfway through, until golden brown and a cake tester inserted in the center comes out clean, 30 to 40 minutes. Transfer pans to a greased wire rack. Let cool 15 minutes. In the bowl of an electric mixer, beat cream cheese and vanilla until light and creamy, about 2 minutes. With mixer on medium speed, gradually add butter, beating until incorporated. Reduce mixer speed to low. Gradually add sugar, beating until incorporated. I really enjoyed putting this cake together when I realised that the flowers weren’t actually that hard to make. And I’m quite proud of the final result. Well done Rachel – this looks great! I love making the flowers it’s sooo relaxing. 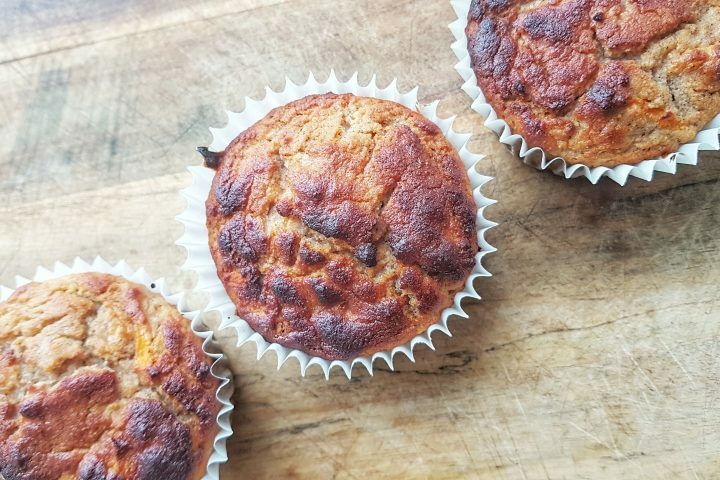 If you follow Sunday Baking on Facebook you can make sure you don’t miss out on any new recipes too!